Lots of clean air at Raglan for Christmas . The Air Matters Team headed to Raglan by the sea (Whaingaroa) for our Christmas outing. 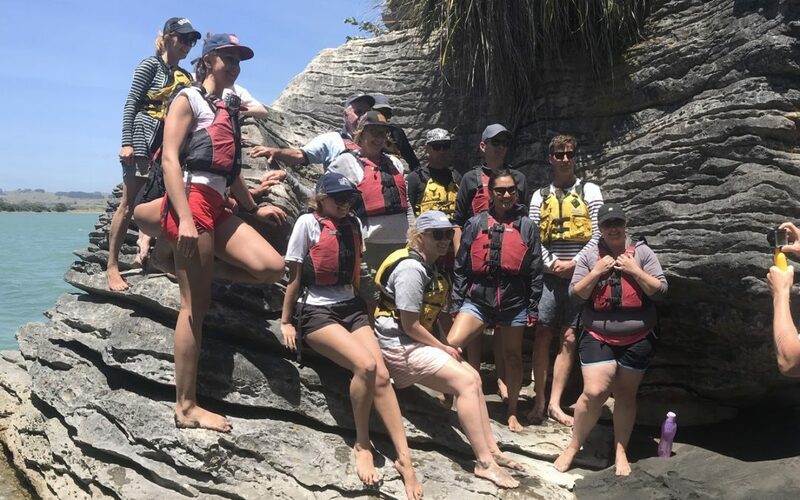 We kayaked across and up the harbour to Te Akau on the incoming tide, and enjoyed taking the canoes through the limestone formations as we moved along the coast on the northern side of the harbour. Thanks to Raglan Kayak and Paddleboards for looking after our safety. The landscape was beautiful and you can’t go to Raglan without jumping off the wharf! Raglan is also known for its great cafes, so of course we had to check these out before heading back to Auckland.